1. 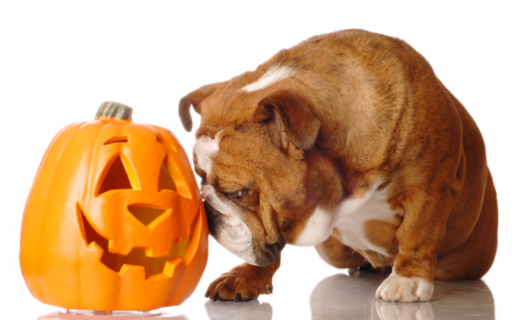 Trick or treat candy is great for your children, but those sweets are not great for your pets. Chocolate of any kind, especially dark chocolate, is toxic for your dogs and cats. Certain candy with substitute sugar such as xylitol is also toxic. So please keep all candy and chocolate away from your pets. They may think it is a treat but it will only be a trick to real trouble and will warrant a visit to your veterinarian and can even be deadly. 2. Candy wrappers can cause problems, too. When swallowed, pieces of paper and foil may cause an obstruction in your pet’s intestines. Make sure all packaging is placed in the garbage well away from your pets. 3. 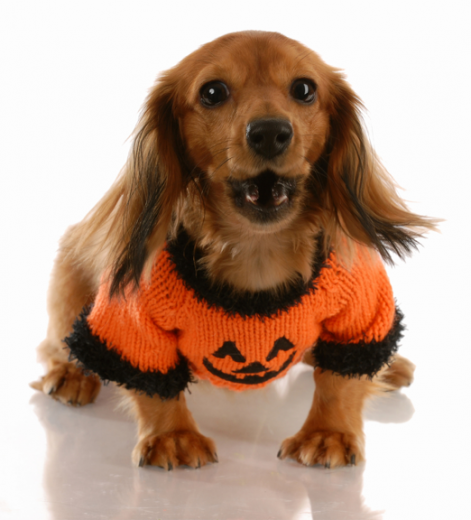 Dressing up can be fun for your children, but can be very stressful for your pet. Some pets do love to be in costume (and they can be really cute) but there are many cats and dogs who will exhibit signs of stress. If that’s the case, maybe a good old bandana would do for your pet’s costume. If you are going to put a costume on your pet (only if they tolerate it), then make sure the costume is safe. It should not constrict the animal’s movement or hearing or impede his or her ability to breathe, bark, or meow. Make sure there aren’t any small pieces that they can chew, choke on, or swallow. 4. Ding dong… trick or treat… ding dong… trick or treat… ding dong… trick or treat. Many people coming at your door can be stressful and scary and may cause mayhem. Keep your pet in a separate room away from the front door during those peak hours. Doing so is also safer, preventing a pet from running out the door. If your pet does escape, a collar with your name and contact information and even a microchip can help locate your pet and ensure a safe return. 5. Halloween candles in pumpkins and jack-o-lanterns may look cool and spooky, but it may cause problems for you and your pet. Your dog can easily knock a lit pumpkin over and cause a fire. Little kittens can be curious and can get burned or singed. Be careful where you put your candles. Holiday celebrations bring together good food, beautiful decorations, fabulous parties, and welcome guests. Keeping your pets safe and happy during these gatherings means coming up with a game plan beforehand and making sure visitors are on board. While dogs and cats may gladly eat any tidbits tossed their way, human food can be harmful, even dangerous, for your pet to ingest. Twinkling lights, flickering candles, and glittering ornaments create a festive atmosphere but may mean a trip to the animal hospital’s emergency room. You may describe your pet as “people friendly,” but when faced with a crowd and loud noises, even the best behaved dog or cat may become unpredictable. So keep your holiday events safe and your pets happy by checking out the following tips. Turkey bones can splinter and, if swallowed, cause tears in the esophagus and the stomach. Watch the nuts! Macadamia nuts, in particular, can be toxic to dogs. Also keep your pet away from grapes and raisins. (Sorry, you can’t feed your Aunt Ethel’s fruit cake to the dog). Chocolate contains an ingredient—theobromine—that can make your animal very sick. The darker the chocolate, the higher the risk. Milk chocolate is not as dangerous, but is still toxic. So no sweets for your sweetie! Yeast dough for those pies and biscuits can cause bloating in animals. Watch pets during food preparation to make sure anything that falls on the floor doesn’t end up in their stomaches. Candy and gum containing Xylitol can be toxic to your pet and cause a sudden drop in blood sugar, lack of coordination, and, possibly, a seizure. Never place bowls of candy on low tables. Fragrant blooms and green stems add color to your party. But certain ones can be poisonous to your pet. Lillies produce a chemical that can produce kidney failure in your cat. Poinsettas are lower in toxicity, but if your dog or cat chews on the leaves or flowers, you may see vomiting and diarrhea. Evergreen trees are not, in themselves, poisonous, but if needles are swallowed, the result may be a gastrointestinal upset. Watch that your cat or dog does not drink out of the tree’s water pan where bacteria may be growing. Sometimes trees have been fertilized, and drinking the tree’s water can make your pet very ill.
Holly–the leaves and the berries—are mildly toxic to pets. Deck the halls with something else. That brings up…. When outfitting your tree, place breakable items higher up. If you opt for tinsel, keep those silver icicles on top, too. Tuck electrical cords where they cannot be chewed. Protective covers for electrical cords may be purchased at hardware stores. Candles for Hanukkah should be kept away from pets. Same for Christmas candles. Ribbons, strings, and wrapping paper, if ingested by your pet, will most certainly lead to trouble. Christmas morning, take out a large garbage bag to quickly dispose of all those wrappings. Know your pet. What makes your pet uncomfortable? If lots of strangers milling about your house creates a hostile environment for your pet, remove your cat or dog to a room away from the crowds. Watch children. Even the best behaved dog may react negatively to pulling and poking by a small child. Talk to your guests. Make sure your visitors know not to approach your pets without you present and understand your rule about feeding table food. Animals like routine. Even if you have guests, make sure that your pets are fed and exercised on schedule. If you are the visitor rather than the host, ask whether your pets will be welcome. If not, make arrangements to board your pets or hire a pet sitter. Symptoms that your animals may be sick include vomiting, diarrhea, hyperactivity, and pacing. Keep emergency numbers handy. The ASPCA Poison Control Center website has a list of toxic and non toxic plants. If you have questions, call the center at 888-426-4435 for a $65 consultation fee. Upper East Veterinary Center now has it’s own YouTube channel! For the first video, Dr. Talia Goldberg of Upper East Veterinary Center, demonstrates how to brush your dog’s teeth. Have you brushed your dog’s teeth today? Probably not. Let’s face it. Taking care of your pet’s teeth, whether you have a dog or cat, can be a challenge. Yet dental health is as important for pets as it is for humans. So don’t wait for that annual checkup to discover your pet has a dental issue. There are some things you can do. What are the risks if you ignore your pet’s dental health? Bacteria and tartar buildup in your pet’s mouth may cause inflammation leading to bad breath, gum disease, abscesses and pain. While your pet may not get cavities, he may develop gingivitis, fractures, and loose teeth. How can you tell if your pet has a dental problem? Bad breath is a big tip off. Also take note if your dog or cat seems to have difficulty eating. Other symptoms include drooling, excessive licking, pawing at the mouth, or rubbing the face against objects. Your dog may allow you to inspect his teeth. Try holding his mouth and pulling back his lips. Cats, however, are unlikely to sit still for this type of inspection, one reason why observing your cat’s behavior becomes even more important. Brushing.Start early with preventive care, brushing your pet’s teeth with a special tooth paste made for dogs or cats. Never use toothpaste meant for humans. (In video above, Dr. Goldberg shows how to brush your dog’s teeth). Dental rinses. These can be squeezed into the pet’s mouth. Okay for them to swallow. Use chews. Special “greenies” for dogs and cats can help clean teeth. There are also antiseptic raw hide chews for dogs. Check for color. As pets age, teeth age as well. Your pet’s teeth should be white or off-white. Yellow or brown teeth should be inspected by your veterinarian. Consider genetics. Just like with humans, some pets inherit bad teeth. If your pet is so blessed, you may need to be particularly vigilant. Cats have other issues. Cats develop a condition called resorptive lesions, a genetic disease, which often requires extraction. Watch bones. While some bones are good for your dog, smaller, softer bones, like marrow bones, may splinter and cause fractures. Special diets. Ask your vet if a special prescription diet may help safeguard your pet’s dental health. Consider a professional cleaning. Tartar buildup is categorized by numbers, from one through four. At the higher level, a professional cleaning by your veterinarian may be necessary. Be aware, however, that such a cleaning will require anesthesia. While you aim to safeguard your pet’s dental health, be realistic. Do what you can do—what your pet will let you do. And, most importantly, don’t forget to schedule that annual physical with your veterinarian.